Product prices and availability are accurate as of 2019-04-23 17:43:40 EDT and are subject to change. Any price and availability information displayed on http://www.amazon.com/ at the time of purchase will apply to the purchase of this product. The DEWALT DWC1KIT-B Brad Nailer and Compressor Combo Kit features a DWFP12231 18 GA brad nailer, and a DWFP55126 compressor. The Brad Nailer drives 18 gauge nails from 5/8" (16 mm) to 2" (50 mm) length. This nailer offers a long life, oil-free motor with a tool-free depth-of-drive adjustment with detents for proper setting of nail heads. It also has a tool-free jam release mechanism for easy nail removal. The rear exhaust to help keep contaminates away from work, and a magnesium body delivers strong & lightweight design. It also has a removable non-marring nose tip with on tool storage, and an adjustable belt hook that allows the tool to be kept near the user. 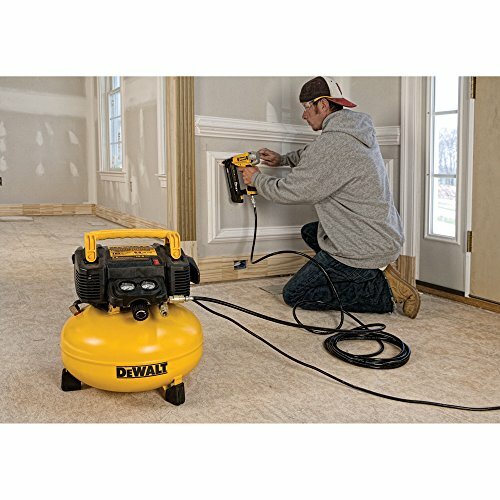 The Air Compressor offers 2.6 SCFM delivered at 90 PSI pump, 6 gallon (22.7 L) tank and 165 max PSI for long tool runtime and fast recovery (Tested per ISO 1217). The durable oil-free pump provides long maintenance-free operation, and a low 75.5 dBA for a quiet work environment (Tested per ISO 3744). The low 10 Amp draw motor starts easily in cold weather or with extension cord, and it has two regulated, factory installed air couplers to easily support two users. Shroud includes heavy-duty handle, cord wrap and console cover to make unit easy to carry; only 30 lbs (13.6 kg) for easy portability. 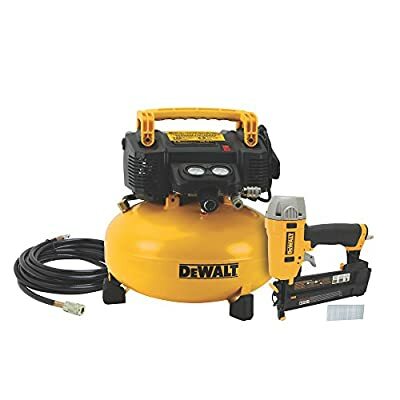 Kit includes: (1) DWFP12231 18 ga Brad Nailer, (1) DWFP55126 Compressor, Air hose with fittings, sample fasteners, and owners manual. DWFP12231 Brad Nailer drives 18ga nails from 5/8" to 2" length. DWFP55126 Compressor offers 2.6 SCFM delivered at 90 PSI pump, 6 gallon (22.7 L) tank and 165 max PSI Tool-free depth-of-drive adjustment and tool-free jam release Low 75.5 dBA for a quiet work environment Kindly refer user manual for instructions.